Apparently, this “little blog” of mine has gotten to the point where I am being contacted by various companies asking for product reviews and things. This is very flattering for me, but it also puts me in a tricky spot. I don’t want to be “that blog”. You know the one – The Sell Out Blog. The blog that I drop because they have become a marketing tool and I can’t trust their advice anymore. icky icky. Also, it stresses me out to read advice from “The Really Big Bloggers” about how you need to get fair compensation for working with companies, because when you don’t you are hurting other bloggers. Then there is some legal dispute over how to run a “sweepstakes”. sigh. It is one big murky mess. So, I am embarking on this very first full-fledged review post (plus giveaway) with some trepidation. I would value your feedback (send me an email!) about how you feel about reviews and giveaways popping up on this blog. I will ALWAYS ALWAYS ALWAYS disclose my relationships with companies. (It’s the law after all.) If this doesn’t work out and you hate it, you won’t see this kind of thing again. deal? Disclosure: I was given a set of Rubbermaid Bento storage boxes for review. I was not compensated for the content of this review or for hosting this giveaway. All thoughts, writing and opinion in the post are my own. But hey, they gave me free bins. So, I guess you should take this with grain of salt. Last month, I talked about making time to sew and the importance of gathering your supplies together in preparation for those sacred sewing moments. In that post, I showed you a peak at a lovely bin holding all of the supplies for a Mommy’s Poppins bag. It was the first thing I noticed when I pulled these bins out of the shipping box. These things are sturdy-sturdy. Gladys is frequently found sitting, standing, or climbing on these boxes. Not a problem, they can take it. The “Large” size is a perfect fit for Ikea Expedit shelves. The gold standard for bin size, in my opinion. The dividers in the Extra Large bins are a perfect fit for commercial sewing pattern envelopes. Win! What do you think? Would you like a set of very own, for free? 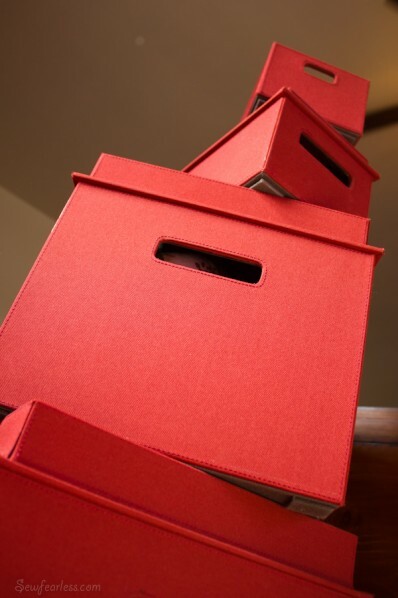 Rubbermaid is giving a set of boxes away to one of you fabulous readers! Set of Rubbermaid Bento Boxes Giveaway!!!! The prize is being rewarded by Rubbermaid. Open to all U.S. and Canada residents, ages 18 and older. One entry per household. Void where prohibited. Entry is open until 10/6/2012 at 12:01 AM EST. TO ENTER, comment on this post. Then use the Rafflecopter widget below to tell me you did! Duplicate or ineligible entries will be deleted. If Rafflecopter or my website poops out on us, I’m sorry. I can’t redo the giveaway because of time constraints by Rubbermaid. A winner will be chosen by random with Rafflecopter and announced on the blog October 8th, 2012. The winner will be contacted by the information provided within Rafflecopter, and the winner must reply back before October 10th, 2012 or the prize will be forfeited and a second winner drawn. This widget is only viewable on SewFearless.com. They are beautiful, and I know I could find a million different uses for them, sewing supplies, scrapbooking storage. The price would definitely slow me down, WAY beyond my budget to purchase. But I’d love a set if you gave them to me!! 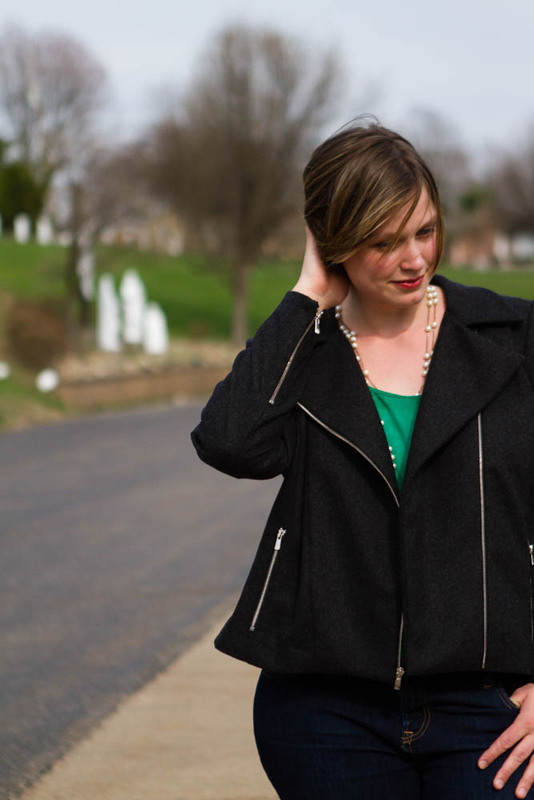 Jodi – There is a fine line between cool indie blog and sell out blog and I’ve seen too many that I’ve followed cross it. I think it’s really cool that you want to stick to the original inspiration of the blog – fearless embrace of the craft. I love your blog!!! I love your honesty about ‘selling out’. I’m enjoying watching your new sewing space take shape! So much fabric to organize and use, so little time! These bins would be great in my small sewing room, just the right pop of color and over the top organization. I am in need of some organization as I have multiple UFOs in the works or projects cut out for Christmas! This would be great to corral them in! 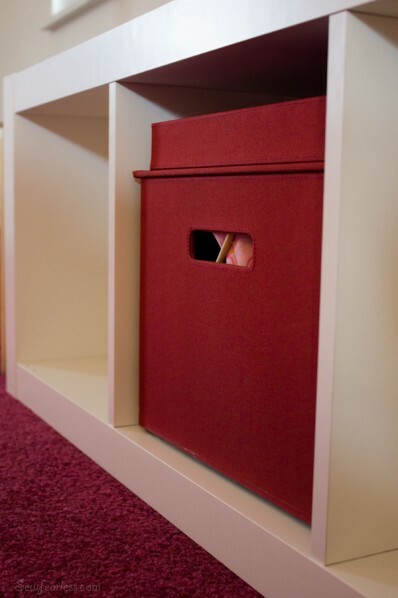 Pretty neat boxes… I would be curious about toy organization in them! I think I entered…that thing is tricky! I am on board with bloggers reviewing products and accepting freebies, especially sewing bloggers who take such time and care to share patterns and tutorials for no reward whatsoever. I know how much time it takes to devise instructions and share patterns, and there’s no compensation. It’s a thankless job often. So if a little perk now and then keeps my fave bloggers plugging away, then I say, take it! I’d love to be entered also. I love your blog ~ and the cute pics you post~. I’m not sure I was entered either…God bless you and your family. I totally leave the organization for “later” because, like you, I use any amount of money we might have “left”, on fabric. I’m a reader of blogs and I have no issues with giveaways. if it are items that you review honestly or it is from companies you stand behind I don’t think it all your a sell out! 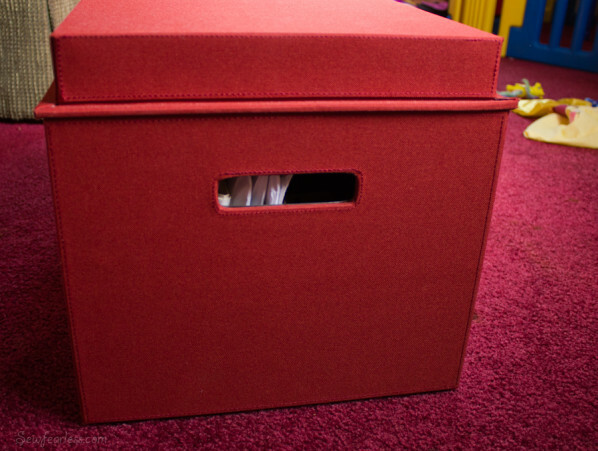 I would use the boxes for all my sewing and crafting supplies and for toys, I love the fact that they are so sturdy , my son would be just like Gladys climbing these :). The fact they fit in the expedit is a huge bonus!! 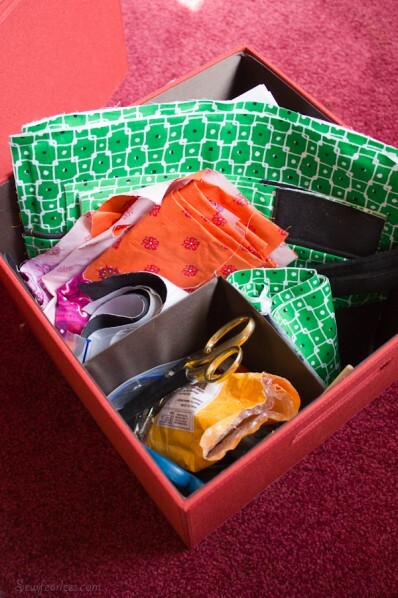 I would use my bins to organize my crafting stash….patterns, yarn, fabrics, cutting tools, paints and markers. I LOVE your blog….I know that I will always get a reliable, note-worthy read sprinkled with humor!!! 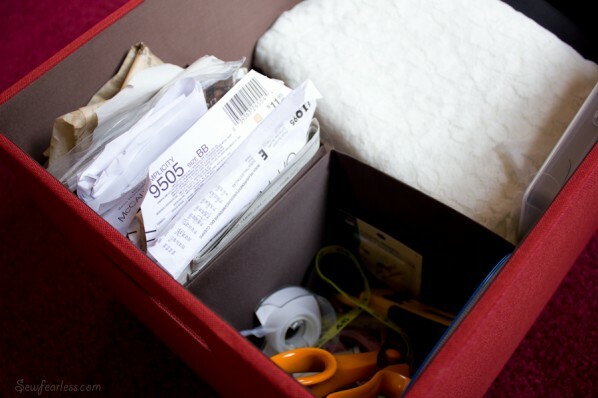 I could use a bin….patterns, sewing accessories, yarns….love to be organized! Thanks! I don’t mind give-aways, and as the child of a Catholic writer and publisher, I think that if you are adding value to a product, then you should be compensated. I’ve been known to review a book or two from time to time, and I get to keep the book as compensation. I’ve even asked to review a particular book if I was interested, but could afford the sticker price. If you just want to share your own creative experiments simply for your own pleasure, then that is reward enough in itself. What I can’t stand are these small blogs that I follow for years and then they have these huge give aways that are designed to maximize exposure, which essentially turn reading the blog into a job. I don’t like it when you get all sorts of extra ‘points’ if you do corny things like tweet and refer your facebook friends for more and more and more entries. I have no problem with a simple comment or email entry. US only also bugs me, because as a Canadian, I read mostly US based blogs and I use mostly US based products. It’s bad enough that we can’t find decent fabric at a decent price. I would store fabric and maybe use a few of them to organize in my boys room. it is red and blue. 🙂 I love giveaways; even tho i never win. These look really neat – albeit crazy expensive. Free is nice, though! I would probably use them for organizing homeschooling stuff and crafty projects. I love your blog. I really appreciate the consideration that you are giving to the direction of your website. I can imagine that it is a tough decision to make. I like to win things (and these containers look awesome – but honestly too pricy in my opinion too) and I like periodic giveaways (who wouldn’t love a little free stuff to come their way?). That said, I have seen some blogs that get too overboard in the the giveaways/reviews. In ‘knowing” you (I mean I read your blog, we’re practically friends, right? ), I appreciate your honest opinions on products (and i think it’s cool that your blog can get you free stuff) – but please don’t go over to the dark side … i come here for you not products. When blogs get overloaded with products and ads, all the good stuff gets squeezed out. I love that you share your ideas with us, you are so talented! I watched all your kids standing on these moving day, looking out the window. They are totally sturdy little boxes. I would not stand on them personally, but certainly would use them near my armchair as a foot stool. 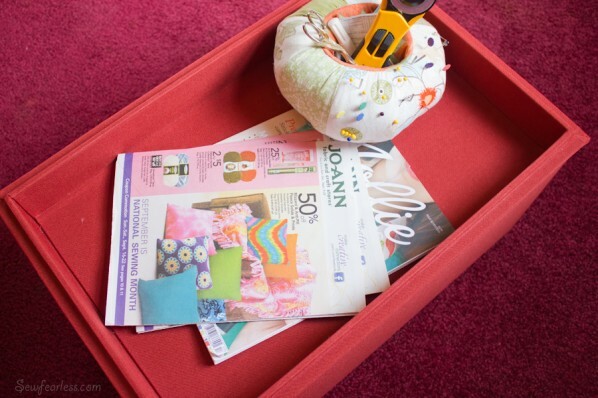 Hey a footstool for my magazines, coupons and handcraft! 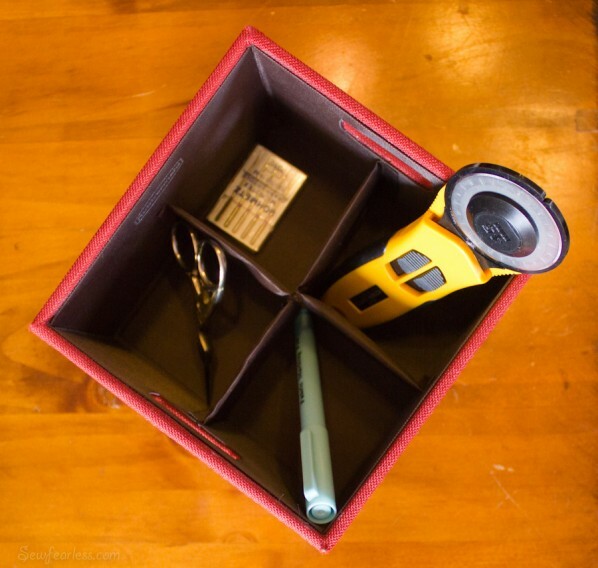 Really a great idea, and maybe fitting neatly under a side table. They look like great storage containers, but I’m especially happy with the bookcase fit (also my gold standard) and their toddler withstanding abilities. Nice review. Presently, I’m storing seeing supplies in laundry baskets! I entered to win… Maybe…. Great blog! And great boxes, as well. Definitely something I would never splurge on of my own accord, but so many ways to use them. The interior dividers are particularly clever. Love, love, love these boxes! Maybe almost as much as the piles of pretty fabrics I would put in them. Thanks for highlighting their uses for us! Wow…AWESOME!! I know that you would be real with the giveaways and such, and so I really don’t have a problem with you doing them (‘specially if I might get a goodie!! LOL!) As long as you keep being your wonderful and real self I think you should run with it!! YOU GO GIRL!! That being said, I would love the boxes, they look great and sturdy, and if they fit into the IKEA theme I have going on in my life, all is well with the world!! Wow, these look amazing! I just had a baby so i would use these to organize the toys that go with having four kids. I would love to give these a try. My sewing items are everywhere. I had a really nice sewing room in Florida and had to move to San Diego unexpectedly to help my mom with chemo. Mom is doing great. I pretty had to start over with my stuff, had a few things sent back but not everything. I need to get organized!!! They look really cool and quite useful to organize more than a few areas in my home, though at the price I doubt I’d be able to buy them. But I can always hope to win some :o) And I think occasional reviews/give aways are fun, not annoying. These look interesting. I like that thay are strong, but sad they cost so much. I do use Joann’s coupons (and senior discount day), so I will have to look next time I go. [Hey! I just got some Joann’s coupons in today’s mail.] Thank you for letting us know that they fit in the shelves. Fabric, fabric, fabric!!!! And I would begin to organize craft/school supplies for my preschooler! I understand your trepidation with the blog giveaways. I’ve started doing them in the past year, but haven’t had a lot of interest with some of them getting only three people entering. I also worry that I might annoy people or that they’ll take my reviews less seriously when I got something in return for doing them. But then again, if I’m essentially advertising a product (that I actually like) why shouldn’t I get a freebie or better yet paid for it? I wouldn’t stop following your blog because of them, unless every post was a giveaway. Also, I like the fact that your review was honest & you were upfront about the fact that you think these boxes are expensive. nice!! I’m a sucker for more places to stash fabric and yarn and patterns 🙂 I hope I win!!! Those look really great. I wonder if they would fit into an Ikea Expidit? The look like they might. Hey, I’m in the UK so I’m never allowed to enter blog giveaways! !…… I completely understand your trepidation, but like many others have said, it’s simply a matter of knowing where to draw the line: getting the odd perk now and then for devoting the time it takes to run an interesting blog is absolutely fine; it’s only when every post has a sell in it that it puts most people off I think, and particularly so if it’s not something that has a link to your writing (unlike these boxes, which look fantastic, if you have plenty of cash – although personally I quite like being able to see inside working boxes, ie clear plastic). I would use them in my closet. I think periodic giveaways are great. You get to receive items, your readers have the chance to win awesome things but by not doing it consistently you aren’t a sell out. I would love to win these boxes. The disaster that is my sewing closet is embarrasing! These would help so much! I just came across your website and I just love your ideas and your blog. The bins look great and I love the sections inside. with so many projects to make, it’s wonderful to have pretty bins to keep them safe and organized. thank you for sharing. Love these containers but speaking as a Grandma, your little Gladys is a very big & cute distraction from the bins! I’m a sucker for storage-y stuff, and these boxes look nice 🙂 Although honestly I don’t know if I would fork over those big bucks on my own! Those bins look like the perfect storage solution for my completely out of control craft room! 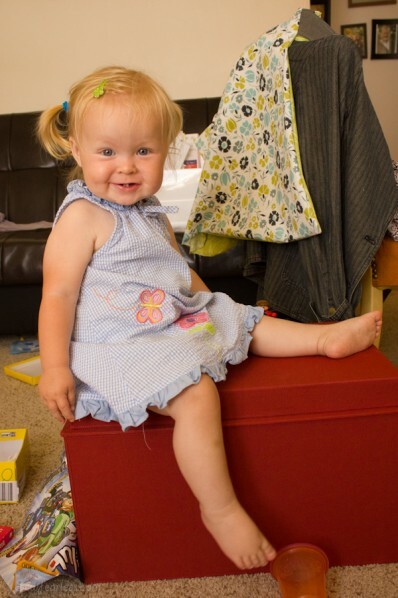 Love the little lady atop the box! Reminds me of princess and the pea. Don’t worry about selling out… Just do what feels right to you! Hmmm. Either fabric or toys. sewing sewing and more sewing!!! I’m sure this is not an orginal answer, but my over flowing fabric could use a home. My son would probably end up playing and putting his toys in them.. he loves boxes and could use a way of organizing some of his toys. I would love to win these – i’m a yarn fanatic and unfortunately so is my dog! I have to keep finding new hiding places! OMG! What an awesome idea! The boxes are not only practical but pretty. I can see organization on the horizon. I see a sewing box, scrapbooking box, crochet box, school supply box and most importantly a “me” box. I want them! I like how you organized by project and I would mimic that. I had been trying to organize by stash by item but that sure hasn’t been working. As for thoughts on giveaways, I think as long as you’re honest and provided pros and cons (just like you did here) you’ll be just fine. I also appreciate that you didn’t have to jump through a million hoops. Was so glad to see Gladys sitting on one. Can’t tell you how many boxes have gone flat thanks to my fabulous felines. Thanks! Super nice boxes. I would of course put yarn in them if I go them. Also, I would probably go to IKEA to buy a shelf for them. Nice idea for organizing! Yes, they are expensive, but they will last forever, not like my zipper bags, or small cardboard boxes I put my sewing supplies in. These boxes are so neat, saw them in Joann’s!! These look awesome, but I agree a little bit expensive! But what I could do with them if I were to win them…….Oh the possibilities are endless! I would give these to my daughter who loves to do art crafts-making cards etc. Wow, these are pricey, but they look wonderful. I think I would use these to store all my beauty and grooming supplies. I recently started following your blog and love it! Great product review by the way. I could store a lot of my sewing supplies in these boxes and finally organize my sewing corner! Hmmm, I’m thinking the toy closet could use some organization, although after looking at my daughter’s room, maybe they should go to her! OMG, SO many things I could use these bins for! Sort and store my fabric stash, my yarn stash, my dog training supplies, my kids’ homeschooling supplies, my beekeeping supplies, and onward… We NEED something like this desperately! I’m trying to get an adult daughter set up in her own apartment and reworking our house so everyone has a spot. These would be perfect! It would be great to win, I’m busy moving my sewing room around. omg! I was just pondering what the heck to do with all my patterns and your idea is great, not in my budget but great! Maybe I can win and it will be the super greatest! I would use the bins to organize my craft supplies. That red color is beautiful. I’d put my knitting stuff into one and probably patterns and sewing odds & ends into another. 🙂 Thanks for your honest opinion and for the giveaway. I feel giveaways are fun, but appreciate it when they are just every now & then. I really enjoy the honesty of your blog!